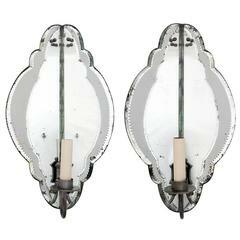 An unusual pair of 1940s French mirrored corner sconces with shaped glass panels. Recently rewired. 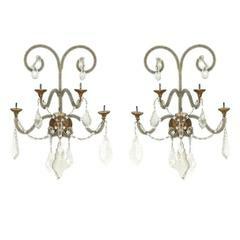 A pair of crystal and glass beaded five-arm sconces with giltwood bobeches, Italy, circa 1940. 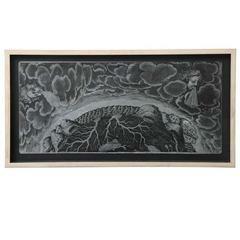 A zinc lithograph plate in the style of Fornasetti. Milan, Italy (1913-1988). 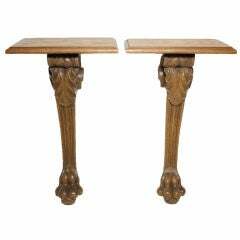 A pair of Napoleon III carved oak wall brackets featuring acanthus leaf detail at knee and pawed foot base. 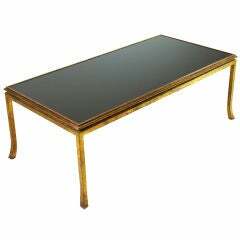 A gilt bronze and black opaline glass top coffee table by Ramsay. Measurements at base: 44.75" W x 23" D (where legs turn out). 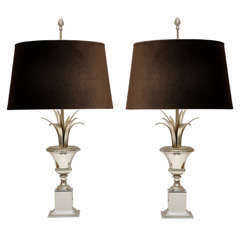 A pair of silvered urn and spray table lamps by Maison Charles, with custom brown velvet shades done by Branca from the Casa Branca collection. 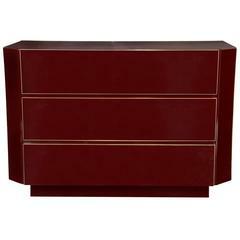 A 1970s three drawers Burgundy red lacquer chest with gilt brass edges, work attributed to Maison Jansen. 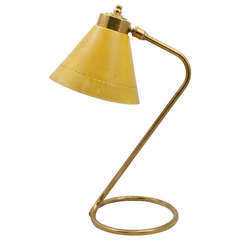 A scroll curved gilt metal desk lamp with it original yellow painted tole shade. 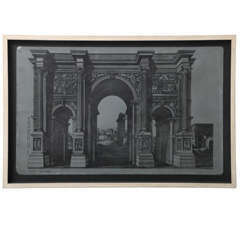 From Branca Casa B Collection. France, 1950. 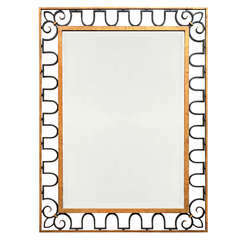 A 1950s gilt and black iron mirror, with geometric frieze border. 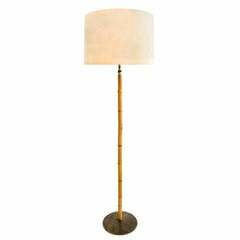 A 1960 French bamboo standing lamp with a brass round base. Vintage silk shade (18" D x 13.5" H for the shade). 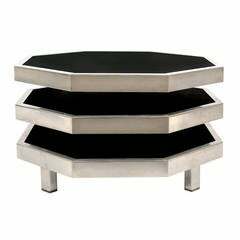 Three-tier swivel black stratified wood and metal octagonal side table in the style of Maria Pergay.